Warner Bros. provided me with a free copy of the Nancy Drew And The Hidden Staircase to facilitate this post. The opinions I share are my own. One lucky reader will win Nancy Drew And The Hidden Staircase! The giveaway is open to US readers ages 18+ and ends on 4/10/19. Void where prohibited by law. Good luck! This brings back wonderful memories from my childhood. I remember spending hours reading Nancy Drew books. Msytery's are great and my niece would love this one and I"d like to present to her. We watched the Nancy Drew movie that came out a few years ago and it was so good. Looking forward to seeing this one. I love Nancy Drew. I read so many of the books as a kid. My friend & I grew up reading these books & loved them! I love a good mystery! :) Love Nancy Drew! We love Nancy Drew , we love a good mystery . I grew up with Nancy Drew so am excited to see the movie with my 17 yr old who also grew up reading about Nancy in my old books. My 10 year old would really enjoy this book. My little one would enjoy this. This looks like a fun movie. I think my niece would love it! I love mystery movies! This looks so good. I remember reading Nancy Drew books when I was a kid. I am so excited to watch this movie with my 12 year old daughter! I read Nancy Drew as a child and its so much fun to share things like that with her. I think she will be more interested because it is updated and will seem more relevant to her. I read all the Nancy Drew books when I was younger. good to see it back. I really want to see this movie. I think my family and I would enjoy it very much. Love Nancy Drew, grew up reading my grandmother's and aunts old books. Would love to share this with my daughter. I enjoyed reading Nancy Drew when I was young. My granddaughter would enjoy this. She has started reading the books. I love Nancy Drew books when I was a girl. I can't wait to see this movie. Thanks for hosting this giveaway! My daughter is big into mystery books. She would really enjoy this! My mom was a big Nancy Drew fan. I would love to share this with my daughter and her. I used to read Nancy Drew books. They have such interesting stories! i wanted to check this out in theaters but it wasnt released in my town. 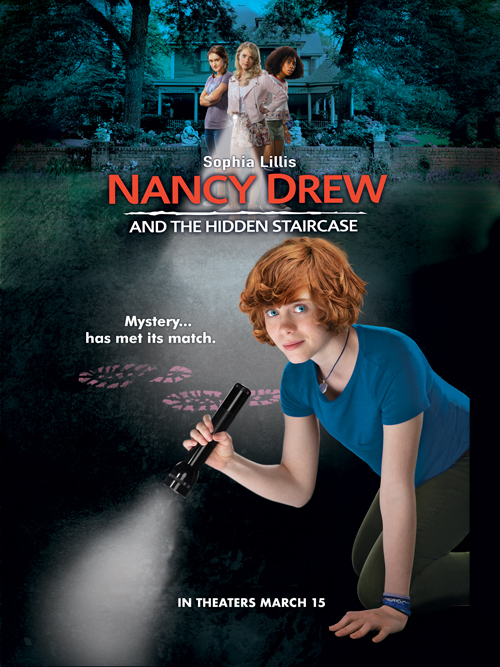 Nancy Drew And The Hidden Staircase DVD would make a perfect themed gift item for a young reader. I used to love the Nancy Drew books as a kid. I hope my daughters will like them too! I absolutely loved the Nancy Drew series as a girl and would love to see this movie! I loved reading both Trixie Belden and Nancy Drew mysteries when I was a girl...and I ALWAYS watched the Nancy Drew/Hardy Boys mysteries TV show back in the late 70s! (I'll admit it: I was such a Shaun Cassidy fan). I'd love to introduce my niece to Nancy through this movie! I can't wait to see this, I read the books and loved them. I grew up reading the books. I enjoyed these books growing up! I like the puzzles and clues.